Technology Projects – Sean Owen Clancy, Ph.D. I really like getting more use out of the technology and devices that they were originally designed. Sometimes extending their capability can be done through applications, operating systems, or hardware modifications. Amazon’s first Kindle Fire has been a great tablet, more so if you make use of the Amazon ecosystem. One of the major problems with it though was that it shipped with Android 2.3, which was slow and clunky in some areas. Updating the tablet to Jelly Bean (Android 4.2 / 4.3) sped things up considerably. I currently like the stability and how well Kit Kat (Android 4.4.2) is running on it. Some useful links are below. Below are some screenshots that show that many great apps are available. A year or so ago, I bought a cheap router, a D-Link DIR-601 A1, to try out DD-WRT. DD-WRT is an open source router firmware that can expand the functionality of your router, giving it capabilities not present in the OEM firmware, such as implementing it as a client bridge. Having a client bridge is nice when you want to wirelessly connect a group of wired computers or devices to the same subnet of your network. I ran into a problem with DD-WRT when I couldn’t get my computers connected via ethernet to the DD-WRT bridge to see or communicate wirelessly to my HP all-in-one printer. The issue was that the AirPrint protocol was being blocked. Around that time I found a good deal on some wireless-N PCIe cards for the two computers having the problem and went with those. The DD-WRT router is not being used right now, but may be set up to connect the older Playstation 2 or Dreamcast to the network. Below is an image of the status page for the DD-WRT running on a D-Link DIR-601 A1. 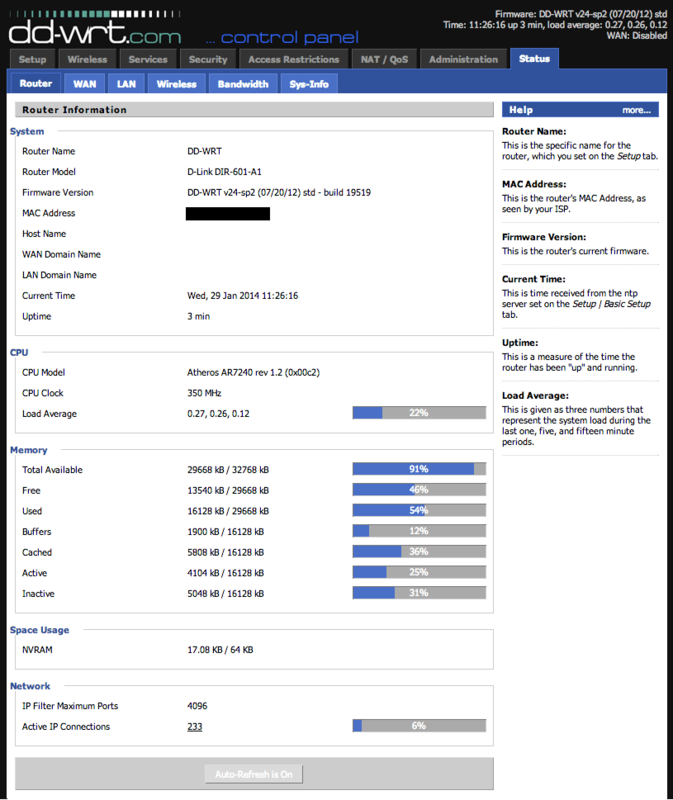 Status page of DD-WRT running on a DIR-601 A1 router. 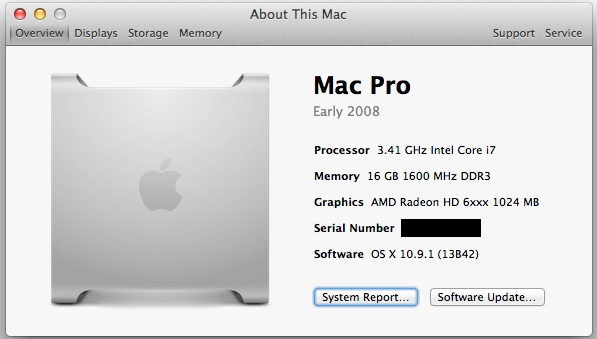 A Hackintosh is a PC with compatible components to run the Mac OS X operating system. Below is a link to a great resource for learning how to build such a computer. Also below is an “About This Mac” image from one such Hackintosh. “About This Mac” screen for a custom Hackintosh running Mavericks. The I-Opener has long been retired, but at one point it made a useful little PC to run Windows 98 Second Edition. It was also capable of running BeOS and several distributions of Linux. A Wii can be software modified to run homebrew applications that allow the Wii to play DVDs or other media files that weren’t previously available. The Dreamcast was a console ahead of its time. Besides having quite a few great games, it was also capable of running a flavor of Linux. The PS2 used to have an official kit to run it as a Linux system. Now a distribution is available for all models of PS2 at the link below.